Oh, the ways women suffer for fashion. One of the most egregious perpetrators of fashion crimes is none other than that object of burning desire, that target of endless lust: the shoe. 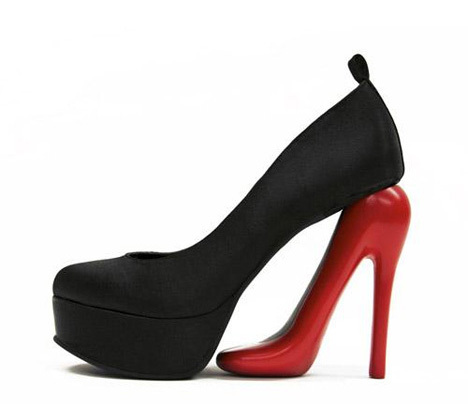 Shoe designers, like fashion designers, often go for over-the-top looks without really considering functionality. These well-heeled examples are often high on form but short on function, though some manage to come up short in both departments. Although most people would want to avoid attracting small children to the dangerous looking heels on the back of a shoe, these heeled wedges do just that. They feature a brightly-colored toy surrounding the heel, making this the perfect footwear for up-and-coming Pied Pipers who need a new way to lure children behind them. Unexpectedly stepping on a LEGO brick in bare feet is one of the most painful experiences the human body can endure, so it seems counter-intuitive to attach LEGOs to the very place where your feet will be. 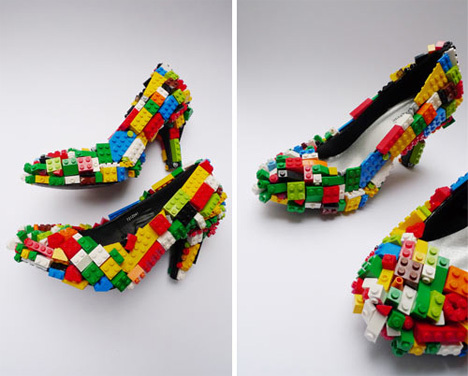 The wisdom of the design, however, is that if the LEGOs are stuck to your shoes they won’t be littering the floor. 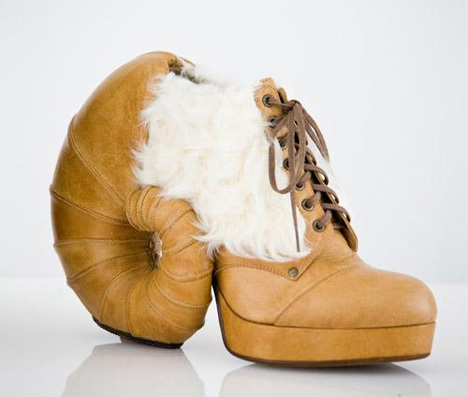 To make the Aries shoe, the designer used several types of animal skins to represent a created hybrid. One short cautionary note: these shoes may remind you of mountain goats, but don’t try rock climbing in them. 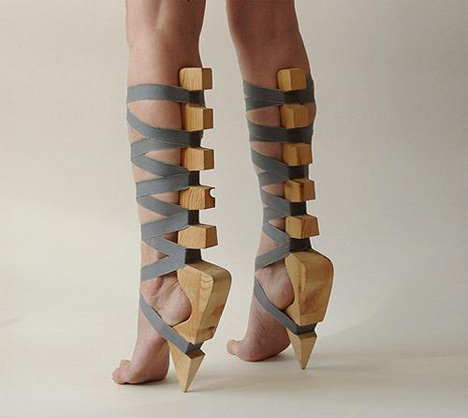 If there is anything more painful than high heels, it’s a pair of high heels made of wood, strapped to your legs up to the knee, with absolutely zero support or protection from whatever may be on the floor. The designer calls these Stelts, and while they are indeed a work of art it is hard to imagine that anyone would willingly wear these. 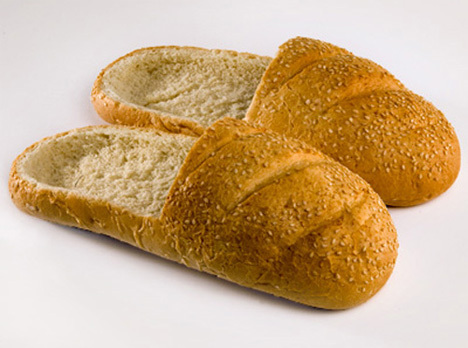 Before you ask “why bread shoes?” we would like to pose an equally important question: Why not bread shoes? While they would be the furthest thing from table-worthy after shuffling around in them all day, we would have to imagine that slipping your feet into warm loaves of bread would be a ridiculously pleasant sensation. Stepping into the Pinned Shoes, on the other hand, would be anything but pleasant. 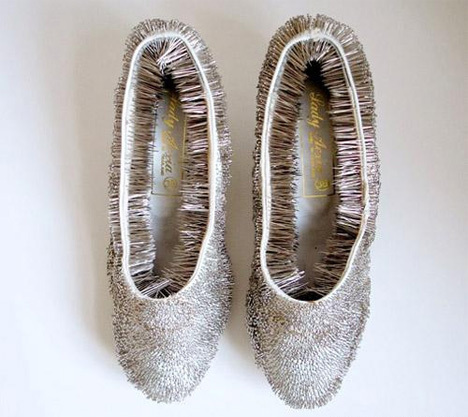 The heeled shoes are made up of two kilograms of pins, making them heavy and uncomfortable, but still oddly fascinating to look at. The Shoe Heel and Double Decker shoes share a concept: two shoes must be better than one, and four obviously better than two. Both shoes use a second shoe as a heel, to some surprisingly unique results. 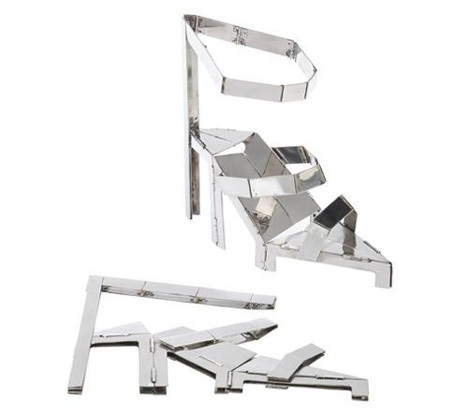 While Shoe Heel looks like a wearable work of art, the Double Decker shoes look almost like a whimsical shoe factory accident. Walking barefoot on grass is one of the greatest pleasures of summer. 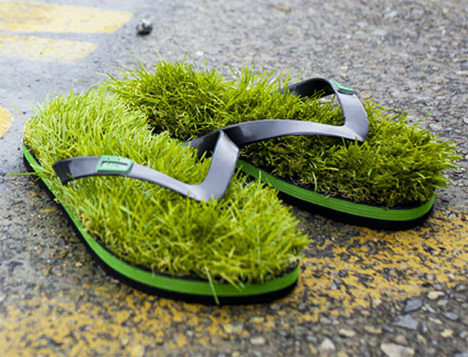 In an attempt to capture that feeling year-round, Kush created the Grass Sandals. 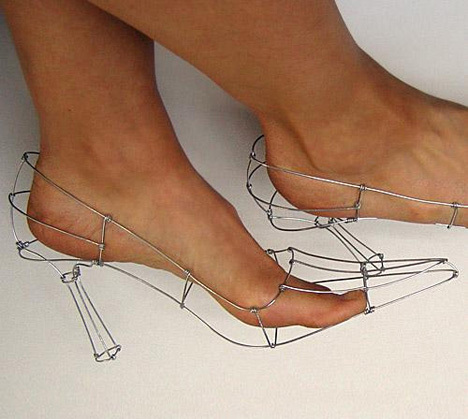 Not to be confused with Cinderella’s glass slippers, these silly shoes are beyond odd. Ask any woman what the most important part of a shoe is. Right after “the grass on the inside,” she’ll probably say “the part that keeps street stuff from touching my feet.” The Souless Shoe and Golden Heel both take the idea of open-toed shoes a bit far by completely eliminating the front part of the shoe, instead basically tying an elevated spike to the wearer’s heels. When designing anything via computer model, building a wire frame is the first step. After that, you begin adding more and more detail until you have a 3D object. The designer of these shoes wanted to invoke the image of a computer wire frame model while at the same time calling to mind the low-res wire frame video games of the 1980s. While most of these shoes are works of art in their own right, the Coloring Pencil Shoes are the only pair that make art everywhere they go. As the wearer walks along, colorful marks are left behind. These are maybe not the shoes to wear to your new boss’s house, but they could make a morning walk to work much more interesting than usual. These Steel Folded Shoes may look torturously uncomfortable, but the idea behind them is sound: a pair of shoes that collapse into a smaller size for travel. Of course, women have been wearing strappy sandals and ballet flats on vacation for just that purpose for many years, and those shoes tend not to cause painful collapse-related injuries like these may. The Mojito shoe is a deconstruction of ordinary shoe design. 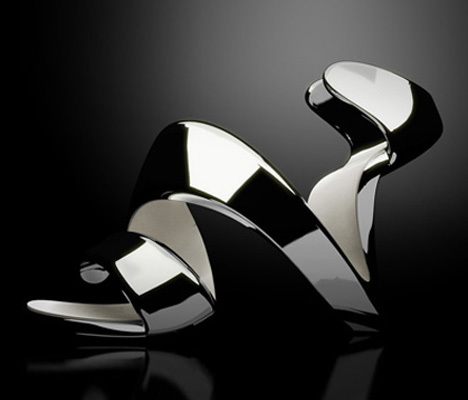 The designer realized that as long as the heel and the ball of the foot were supported, the rest of the shoe could take any form at all – or even no form. 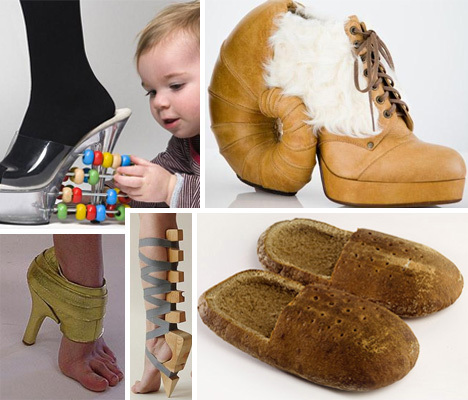 He set about creating the graceful shoe above which, to the designer, looks like a twisty piece of lime peel. Looking like a carefully arranged pile of Post-It Notes, the 100 Pieces of Paper shoes are a sculptural exploration of shape and form. Plus, they give you a handy place to jot down your to-do list for the weekend. 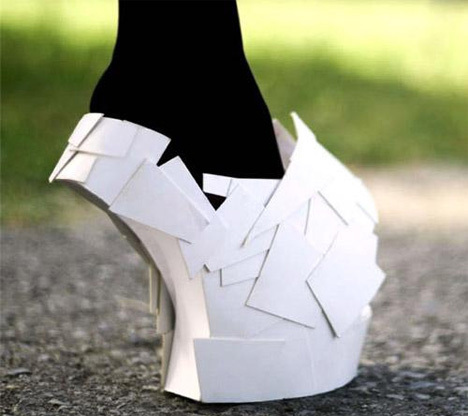 The Contour Shoe jumps off of paper and into real life, becoming a (seemingly) 2D object in a 3D world. They resemble a simple line drawing sketched around a human foot, and their simple line continues on with the leg. 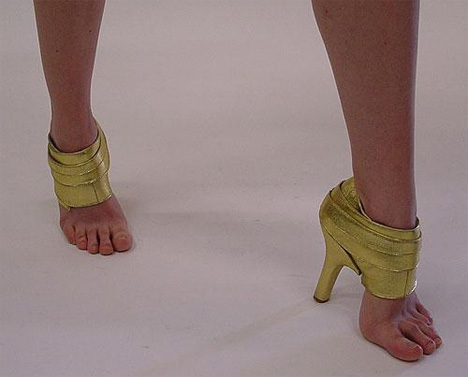 The shoe and leg appear to be one continuous object. Balancing on their ice skate-thin soles seems like it would be quite a challenge. 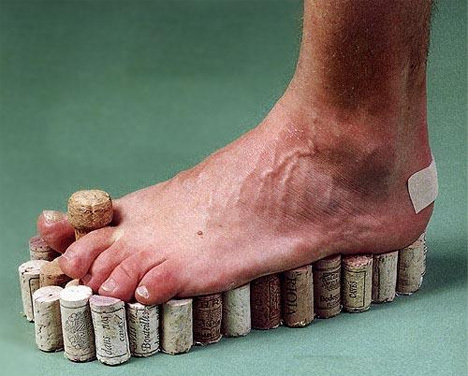 To be fair, these insane cork flip-flops were meant as a joke and not as an actual product. But to be even fairer, we have seen people wearing worse things on their feet. This particular pair was created for a Dutch comedy show called “Kreatief Met Kurk” (Creative With Cork). Multi-tasking is usually a positive thing, but not when it makes you look this goofy. 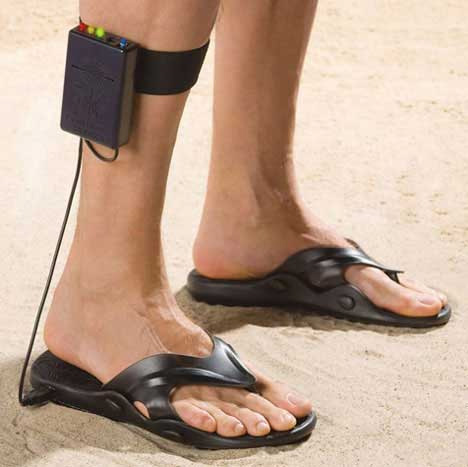 These sandals feature a built-in metal detector that will let you hunt for treasure on the beach…while looking like someone who is supposed to be at home on house arrest. 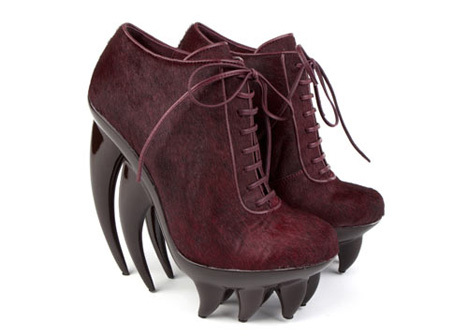 These fang shoes look a bit like cleats for the haute couture crowd. Featuring ten “fangs” per shoe, the vicious footwear is sturdy enough to support the wearer on trips down the catwalk and back. You may want to think twice before wearing them to the airport for your next flight, however.